Have you ever wondered why your mouse cursor rests ever so slightly to the left? Chances are, that little arrow on an incline is so ubiquitous that you've never even thought twice about its 45-degree angle. As it turns out, there's a very good reason for it. Or was, anyway, back in a more pixelated age. Over on Stack Exchange, computer software developer Bart Gijssens revealed the following explanation of the slanted cursor's origins in response to this question on its design. 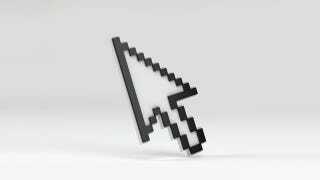 The mouse, and therefore the mouse cursor, was invented by Douglas Englebart, and was initially an arrow pointing up. When the XEROX PARC machine was built, the cursor changed into a tilted arrow. It was found that, given the low resolution of the screens in those days, drawing a straight line and a line in the 45 degrees angle was easier to do and more recognizable than the straight cursor. As you can see below, the original, straight cursor was indeed much more difficult to pick out amongst the blocks of basic text.